The cerebrospinal fluid (CSF) surrounds the brain and spinal cord. When circulation is blocked, it accumulates, causing enlargement of the ventricles (cavities in the brain) and increased pressure inside the head and resulting in hydrocephalus. It is a form of hydrocephalus typical of older people, associated with gait disturbance, dementia and problems of urinary sphincter control. Most cases are of unknown cause, but may occur after accidents, head surgery, intracranial hemorrhage, tumors, cysts, subdural hematomas, meningitis and other infections of the brain. It is characterized by a triad of symptoms: gait disturbance, dementia and problems of urinary sphincter control. These symptoms may not all be present or not at the same time. Gait disorders: the march is to take small steps and shuffling, with problems to turn around or climbing stairs and frequent falls. The gait disorder is usually the first symptom to appear and also the most visible. Dementia with recent memory loss, disinterest in daily activities, or difficulty carrying out everyday tasks. Cognitive symptoms associated with HCA are usually less severe than other causes of dementia, and is often attributed to normal deterioration secondary to age. Problems of the bladder sphincter control. They usually consist of daytime urinary urgency and urinary incontinence in bed at night. The complete loss of sphincter control may occur in more advanced cases. The urgency is that when the patient feels an urge to urinate s/he cannot stand it and if s/he does not go to the bathroom they urinate on themselves immediately. The symptoms of chronic hydrocephalus in adults resemble those of other diseases of the elderly, making it confusion possible. Any pre-senile or senile dementia may be associated with brain atrophy. In Parkinson’s disease gait disturbance and dementia exist, but does not have to have enlarged ventricles. In case of spinal stenosis the spinal cord is compressed and often causes gait disorders and urinary incontinence. HOW IS IT DIAGNOSED HCA? Presence or absence of urinary urgency or urinary incontinence. MRI or magnetic resonance imaging: can analyze the enlarged ventricles, CSF circulation and surrounding nerves. Is the test of choice except in patients with cardiac pacemakers or certain metallic implants, in which CT should be used. CT scanner is faster but the image quality is inferior to MRI. Evacuating lumbar puncture. Allows measurement of CSF pressure and its analysis. With a needle about 50cc of CSF are extracted from the lumbar region. If symptoms improve (even only for a few days) the surgical treatment is expected to be successful. When the result is doubtful there are required further studies. External lumbar drainage. A catheter is inserted in the lumbar region, draining CSF intermittently or continuously for several days, mimicking the effect of the operation. Resistance to CSF ​​drainage. Through a lumbar puncture, serum is injected and pressure is measured to see resistance to absorption. If the resistance is high, you need a referral. Intracranial pressure measurement. 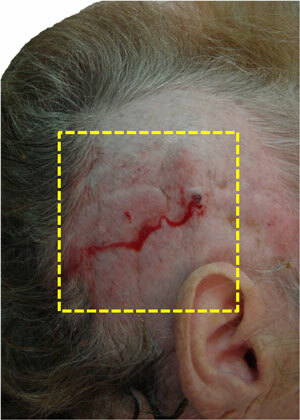 A sensor is inserted, through the skull, in the brain or ventricles. It may show abnormal pressure waves and low or high pressure. Isotope cisternography. Radioactive isotope is injected through a lumbar puncture for CSF absorption. It is rarely used presently. The treatment is surgical implantation of a shunt, a device that diverts the excess CSF out of the brain to another part of the body where it can be absorbed. The shunt consists of three components: 1. a proximal catheter (inserted into the cerebral ventricle or the lumbar spinal canal), 2. a valve (to control the drainage of CSF), and 3. a distal catheter (to drain excess CSF to another part of the body, usually the peritoneal cavity (abdomen) (ventriculo-peritoneal denervation)). The distal catheter can also be introduced into a vein to the heart (ventriculo-atrial). In the lumbo-peritoneal shunt a catheter is inserted into the lower back and goes under the skin into the abdomen, and is inserted into the peritoneal cavity. Gait disorder as the first symptom and the most prominent. 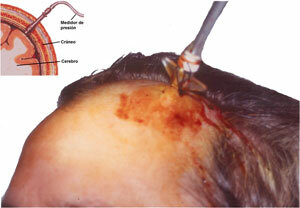 Known cause of chronic hydrocephalus in adults, such as trauma or haemorrhage. Ventricular size greater than the CSF in the subarachnoid space. Dramatic improvement of symptoms after lumbar puncture evacuator. High blood pressure or abnormal pattern or undue resistance to reabsorption of CSF. Some patients with chronic hydrocephalus of adult show also other diseases that can alter the response to treatment. HOW IS THE PATIENT EXPECTED TO IMPROVE? As a general rule much earlier diagnosis is more likely to succeed there. The gait disturbance, dementia and urine-control problems usually improve within a few days but can sometimes take days or even months. The re-emergence of symptoms in a patient who had improved after a shunt should make us think there may be problems with the functioning of the shunt. The coexistence of other diseases can also influence the result. If the patient has multiple strokes, Parkinson’s disease and cervical myelopathy, some of the symptoms may never get better. Older patients are usually more common, partly because of other coexisting diseases. Shunt obstruction is suspected when symptoms recur after treatment success. Other complications: wound infection, the shunt or CSF (meningitis), bleeding in the brain or ventricles, seizures and subdural haematoma. The latter is a blood clot between the brain and the skull, compressing the brain and causing headache, paralysis, coma or even death, depending its their size	.